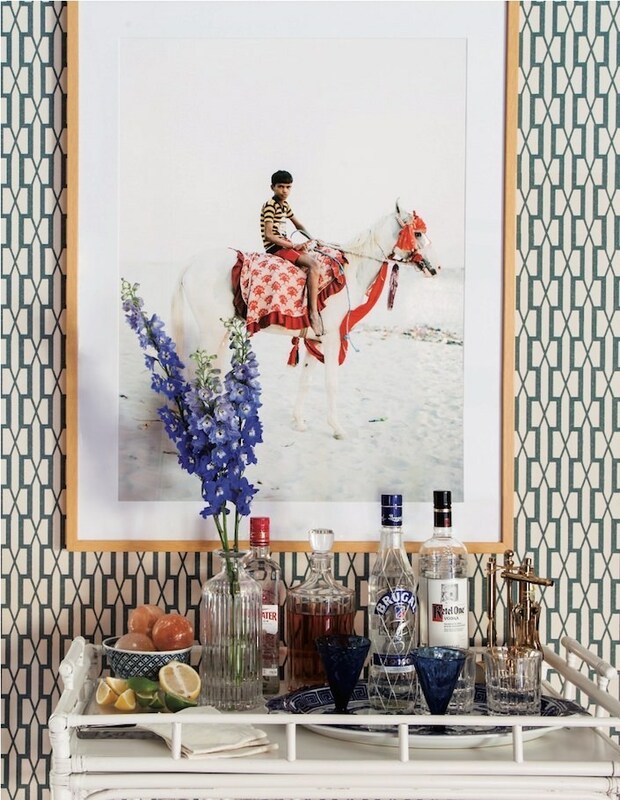 My love of wallpaper is no secret and I was intrigued as Schumacher hinted on their Instagram feed (@Schumacher1889) about an impending wallpaper announcement. 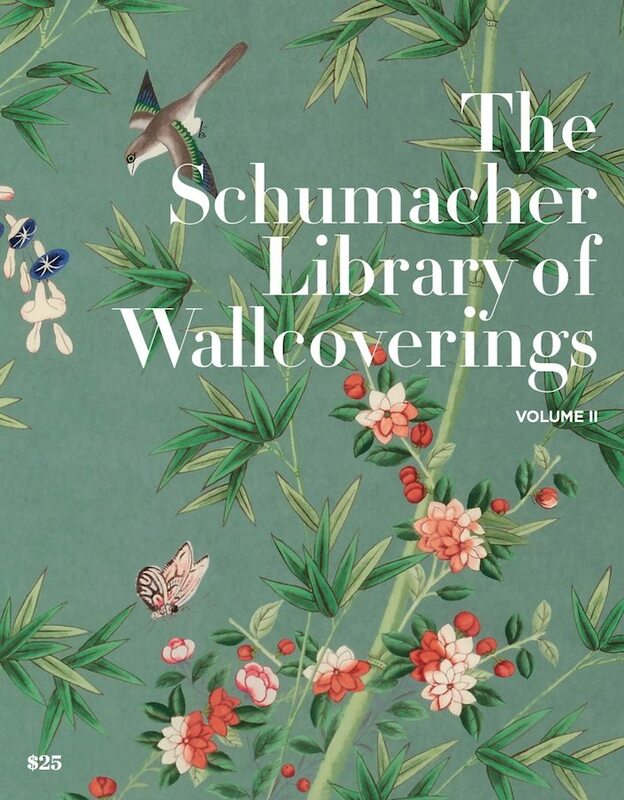 So I am especially excited to be able to share with you their big reveal – The Schumacher Library of Wallcovering, debuting in all domestic and international showrooms next week. 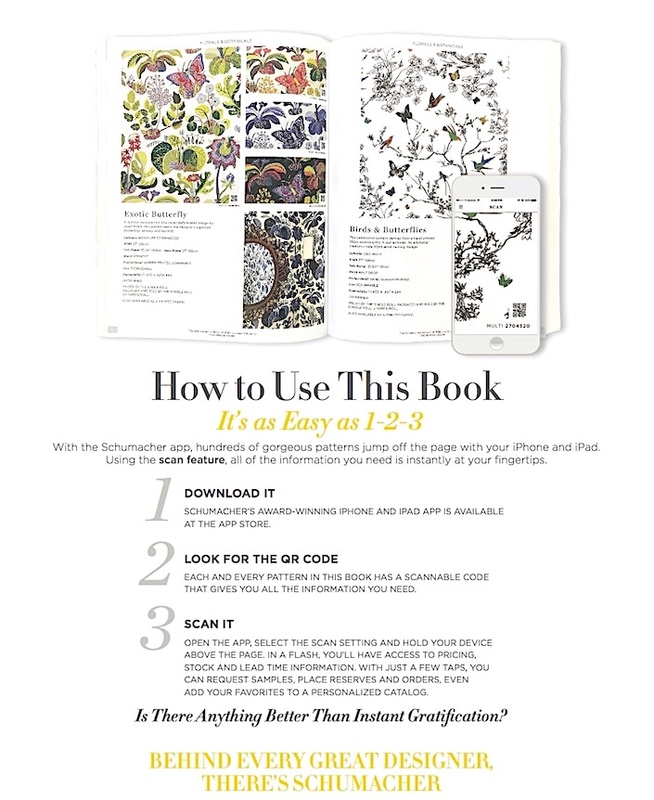 Building on the success of Volume I three years ago, this new edition includes the complete collection of Schumacher’s 1,736 wallcoverings, organized into 19 logical and easy to use chapters. 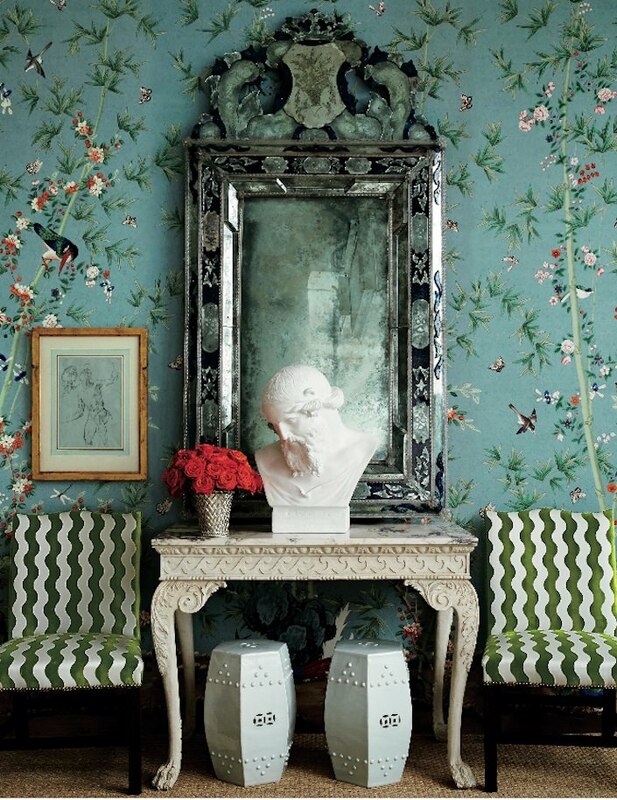 From panels, as seen in an interior by Miles Redd using his Brighton Pavilion panels, above, to chinoiserie, florals, textures, large, small and mid size prints, as seen in a design by Jana Bek using Veere Grenney’s Belvedere, below, and more, each category includes beautiful photography, with over 200 images of installed patterns as inspiration, to easily see and source the products. And speaking of service, each pattern includes its own QR code that, when scanned with the Schumacher app on your iPhone or iPad, tells you everything you need to know including pricing, stock and lead time with the option to order a sample or even product. 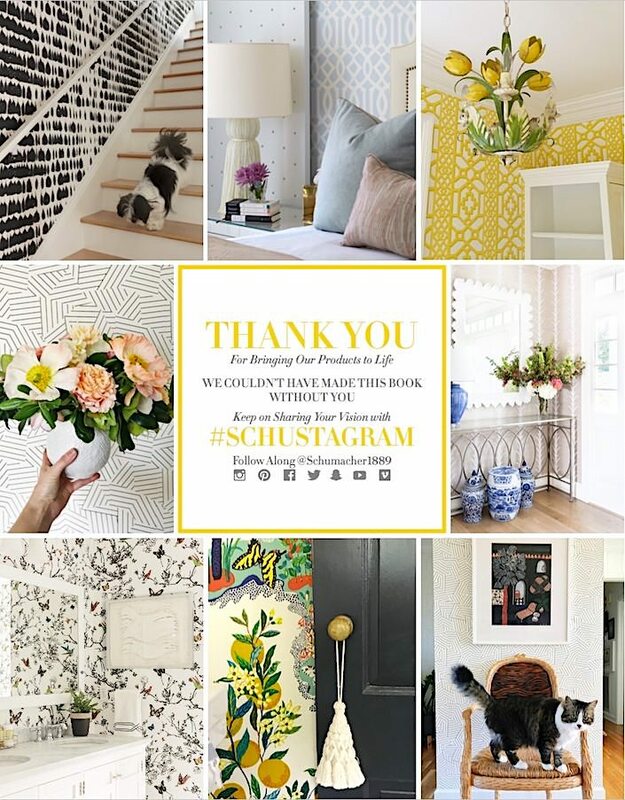 Those of you who follow along on Instagram, have no doubt seen the #Schustagram hashtag, where over 145,000 designers have posted their projects that include Schumacher product. Many of these photos have been included in the book. I asked Tori how that evolved. “In the past year, our Instagram feed has grown 220%; we’ve structured the platform to be a celebration of creativity and to showcase how designers make our patterns their own. We knew from the get-go that we wanted to include all of that great content in the book– after all, nothing makes us happier than seeing how people actually live with our designs.” Perhaps you’ll recognize Cloth & Kind‘s beautiful design below using Celerie Kemble’s statement making Feather Bloom. For example, Martyn Lawrence Bullard used his Fez wallpaper to great effect, above, instead of tile in this bold and graphic black and white bathroom. 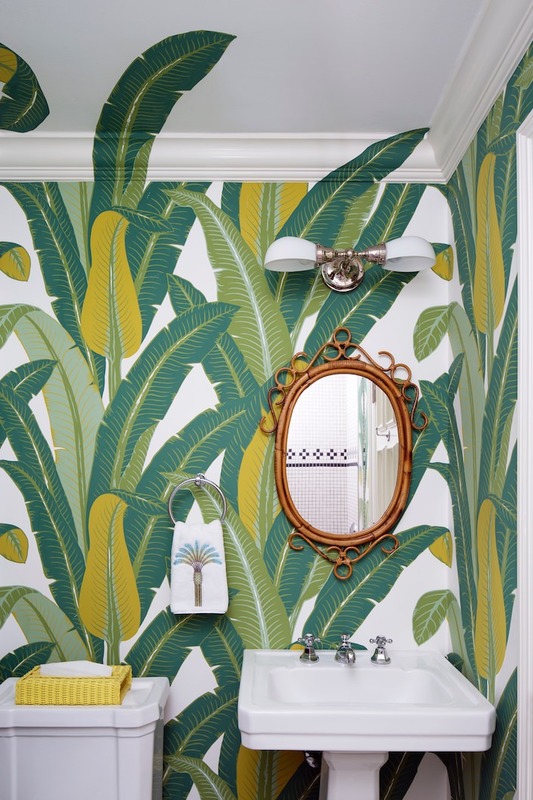 And Kemble Interiors gets extra points for clever creativity with Tropical Isle, as they cut out a few of the pattern’s fronds allowing them to creep over the crown molding onto the ceiling for extra movement and surprise. 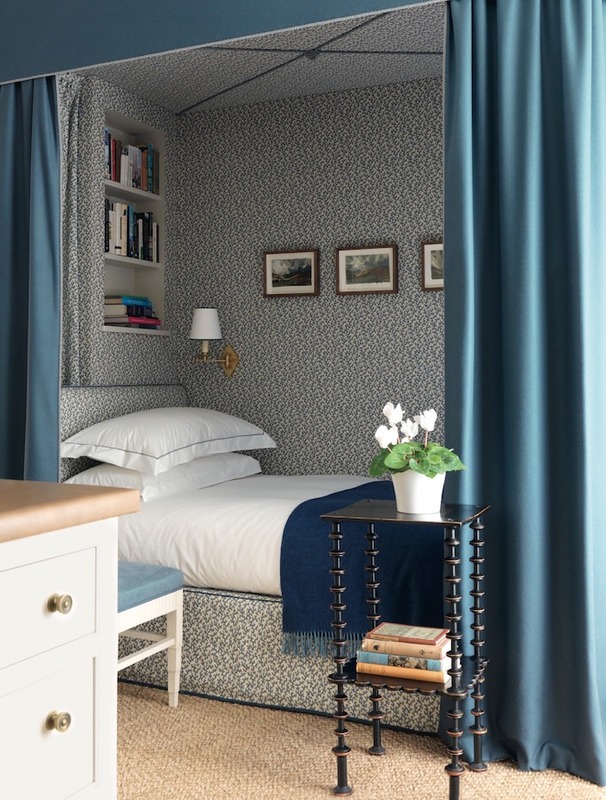 Veere Grenney created this cozy bedroom niche, above, using a combination of Folly wallpaper and fabric. And Andrew J. Howard made good use of the fifth wall as Flame makes a fashionable statement in this dressing room below. If all of these inspiring initiatives seem editorial driven, it’s probably because the Schumacher team, from Creative Director Dara Caponigro to Tori to many others on staff are former design editors and know that it’s all about telling the Schumacher story. If you don’t already subscribe, I recommend signing up for their Style Dispatch, a digital newsletter which, three times a week, brings fun and interesting design missives to your mailbox. In the meantime, if you’re a Schumacher client, I suggest calling your sales rep now to reserve your copy of The Schumacher Design Library. They’ll be in showrooms the week of August 7th and are sure to be spoken for fast. You might just see your own Schustagram inside! This entry posted in books, interior design. 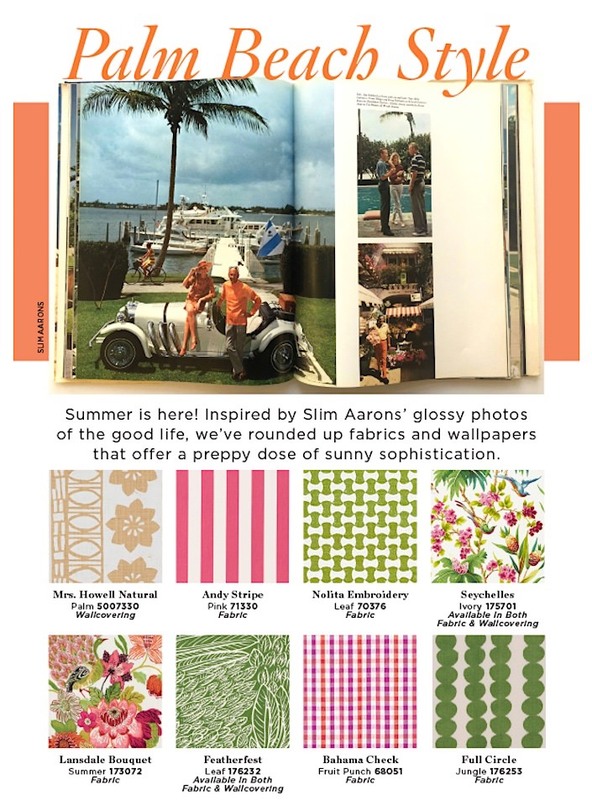 Entry Tags: design book, interior design, Schumacher, The Schumacher Library of Wallcovering, wallcovering, Wallpaper Bookmark the permalink. Being a Floridian..I’m crazy about the creeping fronds. 81 queries in 0.427 seconds.